The cold and frosty weather is here and with MET Eireann issuing various colours of weather warnings, and temperatures plummeting into the minus fields, it can be easy to trip or fall on the wet and icy surfaces. Going for a walk can seem like a challenge if you have mobility issues and the fear of falling on slippy surfaces can cause further trepidation of leaving the house. If you are unfortunate to suffer a fall at some stage, the injury can be significant, and it can also be hard to get yourself motivated again. 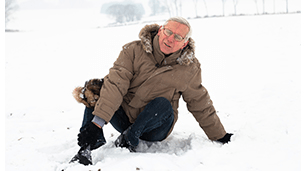 Many falls and slips happen as a result of decreased mobility and weaker muscles. Regular exercise inside the home can strengthen your muscles making them stronger to help avoid a slip. A simple program of exercise for just a few minutes each day can also make a significant improvement to your overall balance. These home exercises can be done on a foot pedal which is simple to use and very compact which allows you to easily store it when you're not using it. Taking simple precautions such as walking in a well-lit area will make the dampened path more visible, whilst also making you more aware of any potential hazards or icy spots. You should try not to rush when the ground is visibly wet or frosty and take your time - If you take smaller, slower steps, it will increase your stability when walking. it away easily when you're not using it. Your footwear will also play a huge part in your ability to avoid a fall when out walking. Suitable shoes that are slip-resistant can assist you on the wet or icy ground by giving you extra grip which will decrease your chances of falling. Although the slip-resistant shoes will help with your grip on the wet ground, you should try to avoid walking on uneven surfaces or surfaces that have debris or obstacles that can block your way. If you use a walking aid like a walking stick, cane, walking frame or rollator you should always check to see if it has rubber tips (also known as ferrules) on the end of them. The rubber tips will increase your grip on the ground which will assist with the stability when leaning on the walking stick or frame. If you are out walking because you are picking up some groceries, try not to overload your hands with shopping bags. Rather than carrying several shopping bags, you should invest in a portable shopping trolley, some are available with a built-in seat such as the Sit 'n' Shop trolley, and this allows you to take a rest should you get tired, which will further reduce the risk of a fall. Alternatively, if you are using a Rollator, invest in one that has a built-in basket. Some rollators such as our Lightweight Aluminium Rollator come with a seat, which also feature a neat storage compartment under the seat and are ideal for shopping trips. During cold and icy spells, you should be especially mindful of your centre of balance. You will move your balance from different sides of your body if you are getting in and out of a vehicle or using stairs/ steps. If there are handrails available to you, you should always use them to increase your stability. Putting your pressure on the handrails, rather than your feet, can make it safer for you. Getting your eyes checked regularly can also have a big impact on your walking. Having full vision allows you to see the path entirely and any obstacles, ice or puddles you may encounter on your journey. If you take these tips into consideration when you are planning your walk during the frosty or rainy weather, you will hopefully be able to prevent a fall.